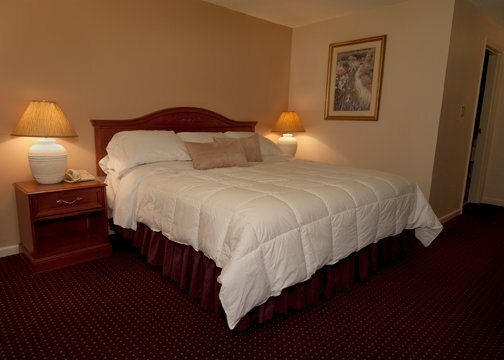 The Caribou Inn & Convention Center features 72 spacious, newly-furnished guest rooms. We also offer three suites, which are generously furnished with a full kitchen, living and dining area. All suites have a Jacuzzi garden tub, king sized bed and a sleeper sofa. Our guest rooms feature one full/double bed, which is considered a single, one king bed, or two full/double beds, which is designated as a double room. We offer a choice of non-smoking and smoking rooms. All of our guest rooms come equipped with a refrigerator and wet bar, large television with a wide selection of cable channels, as well as an AM/FM alarm clock, complimentary high-speed wireless Internet access, hair dryer, in-room coffee maker, iron, & ironing board. For those traveling with their four-legged family members, your pets are always welcome (a nominal service fee does apply.) Our 24-hour front desk service can assist you with safety deposit information and microwave ovens, which are available upon request. We invite you to stay at the Caribou Inn & Convention Center, and experience for yourself that our guests are our number one priority.